Newly-discovered planet Kepler-452b is in the habitable zone of a solar system 1,400 light years away, NASA announced Thursday. Rather than being an image of Kepler-452b, then, this is just an artist’s conception of what the planet might look like. Unfortunately, there is no indication of that in the U.S. News and World Report article. In fact, if you read the entire article, it gets worse. You get the impression that this newly-discovered planet is pretty much just like earth. Such thinking has led some people to call it “Earth 2.0” (see here, here, here, and here). There’s only one problem with all this hype. It just isn’t true. Kepler-452b was discovered using the Kepler space observatory, which was put in orbit around the sun. The observatory measures the brightness of different stars, looking for periods when the brightness drops. If this drop in brightness occurs on a regular basis, the most likely explanation is that a planet which orbits the star has passed between the star and the observatory. The amount that the brightness drops can be used to judge the size of the planet, and the time between those drops in brightness can tell you how long it takes the planet to orbit the star. Using this method, the Kepler space observatory has discovered well over 1,000 planets orbiting stars other than our sun. One of those planets (Kepler-452b) is orbiting a star called Kepler-452. This star has roughly the same temperature as our sun, is a bit brighter, and is a bit larger and more massive. 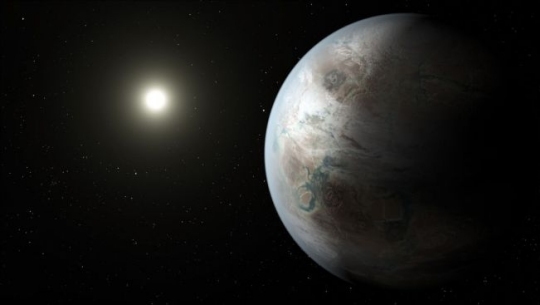 The distance at which Kepler-452b orbits its star makes it a candidate for harboring life. Why? As far as we know, life requires the presence of water in its liquid phase. If a planet is too close to its sun, it will be too hot to have liquid water. If it is too far from its sun, it will be too cold to have liquid water. However, if it orbits its sun at a distance that allows it to get the right amount of energy, it could have liquid water on it, making it possibly habitable. The distance at which Kepler-452b orbits the sun is in the range that would allow for the presence of liquid water, so it is said to be orbiting its star within the habitable zone. Kepler-452b is about 60 percent larger than Earth and it orbits its star every 385 days. That’s all we know, because that’s all that the Kepler space observatory can tell us. We don’t even know if it is rocky. For all we know, it could be a ball of gas, like a small Jupiter. We have no idea whether or not it has an atmosphere. We don’t know if it has water, or any of the other chemicals necessary for life. We have no idea whether or not it has a magnetic field, which is crucial for protecting life from the cosmic rays coming from the star that is warming the planet. We don’t know its mass, so we don’t know if it has the right gravitational field for life. We don’t even know if there is a more massive, companion planet in its solar system to protect it from comets and asteroids, like Jupiter does for the earth. There are all sorts of factors a planet must have to support life, and so far, all we know is that this planet might have one of them: liquid water. That’s it. Of course, that’s a start. Thus, this planet definitely warrants a lot of further study. However, to call it Earth 2.0 is simply nonsense. These articles are very funny to me. According to them, this planet is 60% larger than Earth, has an unknown mass, unknown composition, could possibly have a gravity roughly twice that of Earth, and could possibly be too hot to support life. But it’s so Earth like and so habitable. If such a planet is seen as an extremely special rarity to be celebrated about, then how much more must Earth be special? To the point where its absurd to think that Earth is an accident? I could not agree more. The difference between the media hype and the reality is more often than not astounding. But far too few people have any inclination to go further than the popular media hype. Wow, people are soooo keen to prove that mankind is nothing special and that God doesn’t love us. Tra la la, it’s more of the same. Meanwhile, there’s plenty of unexplored space at the bottom of the sea. One of the groups in my department is involved in direct detection techniques (so not radial velocity doppler shifts or transit methods), so I know a little about these things. I haven’t heard of anyone ever being able to see moons around these planets, and the radial velocity method probably wouldn’t be able to see the effect of a moon. So, along with the many other unknowns, the planet may or may not have a moon. Anyway, that we can find these planets at all – especially smaller ones that (probably) aren’t just balls of gas – is amazing; that we can spout about some of them being like earth is just a catchy news story (like a certain lion being discussed in the news currently). Is Soft Tissue Common in Dinosaur Bones? I’m Back!